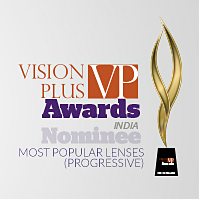 Leading Five In The Category Of Most Popular Lenses (Progressive). Choose The Best One! We bring to you the VP Awards Nominees. Read on to know the ways in which these lenses add value to ones vision experience. Vote For Most Popular Lens (Progressive) category and make your Vote count! visit vp-awards.com and vote now! 1. Zeiss Progressive Individual 2 : If you like this product then vote now! Eyefit Technology: Allows you to enhance intermediate/ dynamic or near vision based on the patient’s visual profile. C.O.R.E Technology: Sharpens off-axis vision through a more accurate calculation of the patient’s optical centre of rotation. Full prescription customisation: Delivers up to 50% wider fields of clear vision. Precise-Form patented back-surface design and fabrication. This entry has been nominated by Carl Zeiss India Private Ltd. So what are you waiting for… Vote Now ! 2. Suprol UniPro Progressive : If you like this product then vote now! This is the only progressive with minimum reflection. Fits in small as well as larger frames. It has very wide intermediate zone. Aspheric design Distortion free lens. Accurate Power throughout the reading area widely accepted. Perfect First Pair and Ideal Replacement Progressive. This entry has been nominated by Indian Optics Pvt. Ltd. So what are you waiting for… Vote Now ! 3. Cappucino 1.56V2 Mini HMC : If you like this product then vote now! Cappucino lenses are one of the most trusted lenses which are available in hard coat and hard multicoat with refractive index of 1.56. They are known for EMI (Electromagnetic Interface) coating, this coating reduces radiation from computer screens and other sources of EMI. It acts like a shield to reduce fatigue or eye strain. These are completely scratch resistant and light in weight compared to others.This entry has been nominated by Mangalsons-Gujarat Ophthalmics. This entry has been nominated by Twin Lakes Enterprises. So what are you waiting for… Vote Now ! 4. GKB Hitech K-plus : If you like this product then vote now! Each Platinum lens comes with customers name or initial of up to 5 letters. This entry has been nominated by GKB Hi-Tech Lenses Pvt. Ltd. So what are you waiting for… Vote Now ! 5.Cappucino 1.56V2 Mini HC: If you like this product then vote now! Cappucino lenses are one of the most trusted lenses which are available in hard coat and hard multicoat with refractive index of 1.56. They are known for EMI (Electromagnetic Interface) coating, this coating reduces radiation from computer screens and other sources of EMI. It acts like a shield to reduce fatigue or eye strain. These are completely scratch resistant and light in weight compared to others.This entry has been nominated by Mangalsons-Gujarat Ophthalmics. So what are you waiting for…Vote Now !